then a sitting room where the fireplace was put, and that was it. As it started to come along, something came up, ventilation or something that they wanted at each end. Jim thought it should have some kind of cross-ventilation. So he decided on a Sunday to go down to Fenlon Falls where Gordon Wallace’s cottage was, and discuss it with him before the workmen went ahead with it. I went along with him and we were talking. I said, “what are you going to do about washroom facilities?” “Well I suppose the same as any other camp”, he said. But can sick people wander outside? We didn’t have a nurse at that time. Eventually I supposed that they counted on having one that would look after them. Well, they weren’t just too sure about that. So I said what about meals. I said there’s no way we could bring meals from our place up there. They would be stone cold by the time it got up. You’d be running up and down the hill. Furthermore, you can’t leave a sick person up there by themselves without somebody staying with them. So they began to sort of look over, the situation again. In 1952 Pow Wow (which was being used for emergency accommodation or wet weather activity) was improved with the completion of a massive stone fireplace and the installation of a stove and additional windows. As more of the camp operations shifted to the Hub area, and new staff cabins were built in that part of the camp, the need for Pow Wow as a staff cabin decreased. 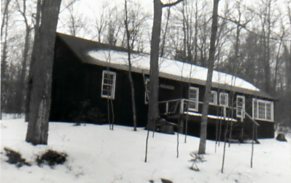 For several years it was used by the Morrow family – Barb (75-87,92-99), Ab Morrow (75-87,92-99) and children – as their accommodation while at camp. Eventually, the general decline in the condition of the physical plant made it unsuitable for residential use. 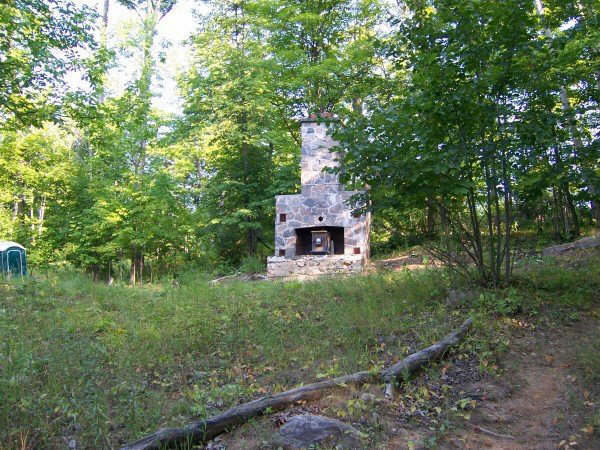 In the fall of 2006, the building was demolished and the site was cleared except for the fireplace.